Mary possesses dual expertise as a musician and music psychology researcher. 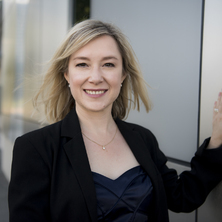 As a classical percussionist, she has performed with orchestras such as the Queensland Symphony Orchestra and West Australian Symphony Orchestra, and has performed nationally and internationally as a chamber and solo musician. Inspired by her music practice, Mary conducts research that applies theory and methods from the psychological sciences to study music-related phenomenon. Her research has focused on the role of movement and gesture in music performance communication. Concurrent to this continuing research trajectory, she is developing lines of inquiry on music in the early childhood years. Broadly, Mary's research spans topics wherever music is a means for personal expression and interpersonal communication, from angles such as perception and cognition surrounding expressive performance to social and psycho-emotional wellbeing. Mary regularly presents her research at national and international conferences, and is a reviewer for many peer-reviewed journals spanning music and psychology fields, such as Music Perception, and Frontiers in Psychology. I am interested in examining how observers respond to music stimuli, using a range of experimental, observational, and questionnaire techniques. Particular interest is in music and motor expertise effects on observer perception of music performance, and audience interest and engagement with contemporary classical music performance. I have also worked on projects focused on music in the early childhood period, social effects on music listening on emotional responses, ERP responses to a novel tuning system, as well as face identity and recognition. Investigating the circumstances and elements, that shape self-employed studio instrumental teachers flourishing in work. Broughton, Mary C., Harvey, Dominic G. and Gigante, Gabriella (2017) Action and Reaction ... Mark II. St Lucia QLD Australia, UQ School of Music. Song Company, Canberra Camerata, Peelman, R., Broughton, M. C. and T’ang Quartet (2010) Concert 2: The Canberra Times Opening Gala. Gold. St. Christopher's Cathedral, Canberra, ACT, Australia, Canberra International Chamber Music Festival. Broughton, M. C. and Etherington, W. (2009) Canberra Symphony Orchestra 2010 Season Launch [recital]. Canberra, ACT, Australia, Canberra Symphony Orchestra. Broughton, Mary and Hughes, G. (2009) Track 5. Prelude for marimba. Brisbane, QLD, Australia, Rhythmscape Publishing Australia. Broughton, Mary (2008) Australian International Marimba Festival [invited solo recital and research presentor]. Canberra, ACT, Australia, School of Music, Australian National University. Broughton, Mary (2007) Prelude for marimba. Brisbane, QLD, Australia, Rhythmscape Publishing Australia. Broughton, Mary and Stevens, Catherine (2009). Physical movement and imagery in professional and undergraduate student solo marimba practice. In: Aaron Williamon, Sharman Pretty and Ralph Buck, ISPS 2009: 2nd International Symposium on Performance Science. International Symposium on Performance Science, Auckland, NZ, (531-536). 15-18 December, 2009. Broughton, Mary, Stevens, Catherine and Schubert, Emery (2008). Continuous self-report of engagement to live solo marimba performance. In: Ken'ichi Miyazaki, Y. Hiraga, M. Adachi, Y. Nakajima and M. Tsuzaki, Proceedings of the 10th International Conference on Music Perception and Cognition. ICMPC10: 10th International Conference on Music Perception and Cognition, Sapporo, Japan, (366-371). 25-29 August, 2008. Broughton, Mary C. and Stevens, Catherine J. (2007). It's not just about sound: investigating marimba performance as an auditory and visual experience. In: Proceedings of the 8th Australasian Piano Pedagogy Conference "Focus on Excellence: Questions and Answers". APPC 2007: 8th Australasian Piano Pedagogy Conference "Focus on Excellence: Questions and Answers", Canberra, ACT, Australia, (1-18). 2-6 July, 2007. Broughton, Mary, Stevens, Kate and Malloch, Stephen (2006). Music, movement and marimba: an investigation of the role of movement and gesture in communicating musical expression to an audience. In: Mario Baroni, Anna Rita Addessi, Roberto Caterina and Marco Costa, 9th International Conference on Music Perception and Cognition: Proceedings. ICMPC2006: 9th International Conference on Music Perception and Cognition, Bologna, Italy, (1127-1135). 22-26 August, 2006. Broughton, Mary C. (2018) Composers in Concert - A Dialogue: Audience research short report Brisbane, Queensland: Broughton, M.C. Broughton, Mary C. and Hughes, Gordon (2005) Track 8. The Cooper Construction (solo vibraphone performance); percussion ensemble performances on REVOLUTIONS [CD & DVD]. Brisbane, Queensland, Rhythmscape Publishing Australia. Broughton, Mary (2004) Bang. Volume 1. Brisbane, QLD, Australia, Rhythmscape Publishing Australia. Broughton, Mary (2004) Bang. Volume 2. Brisbane, QLD, Australia, Rhythmscape Publishing Australia. Investigating participant values, beliefs and practices in one-to-one tertiary classical singing lessons: a collective case study.